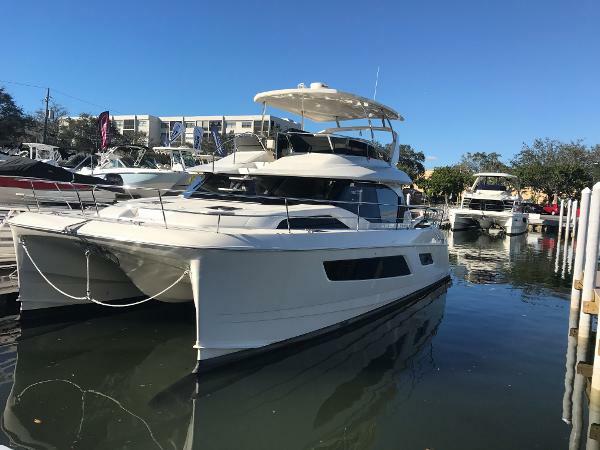 2017 Aquila 44 This is the beautiful new 2017 Aquila 44. Working off the success of the popular Aquila 48, the newest addition to Aquila range is the Aquila 44. She has been designed with the luxuries found on the 48 yet is a smaller version with 3 en-suite cabins.On the Aquila 44 you will enjoy the 360 view from the spacious salon and galley that features a large seating area, hidden TV stowage and plenty of storage to make a live-aboard vacation easy and pleasant. Galley features include Corian countertops, electric fridge and freezer, stove and stainless steel microwave oven as well as a double stainless steel sink. The large staterooms each feature ample headroom and large windows for excellent views. A fresh water flush, separate shower stall, and teak flooring compliment the boats design and exceptional living comforts. Additional features include an oversized flybridge with added enclosure, electric grill, and sunpad seating on either side of the central helm station. Complete with our revolutionary bridge to bow direct access, the Aquila 44 is a fresh revolution of classic boating traditions. Call Mike Stidham in our Southport office today for more information and to schedule a viewing. 2012 Aquila 38 The Aquila 38 power catamaran is a spacious and efficient design allowing for a luxurious blend of easy handling and live aboard comforts. Available in a 2-cabin/2-head layout with a spacious salon and oversized flybridge featuring an innovative design for direct access to the bow. Spacious en suite cabins include ample headroom with large panoramic windows. En-suite heads also feature separate shower stalls. 2017 Aquila 44 The Aquila 44 is a pure bred power catamaran with a fresh evolution of classic boating traditions. Efficiency in design and performance compliment her luxurious living. 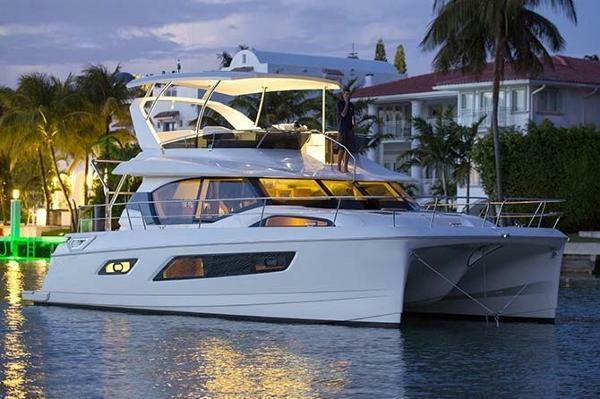 The Aquila 44 features 3 cabins, 3 heads, spacious salon and galley and extensive flybridge. 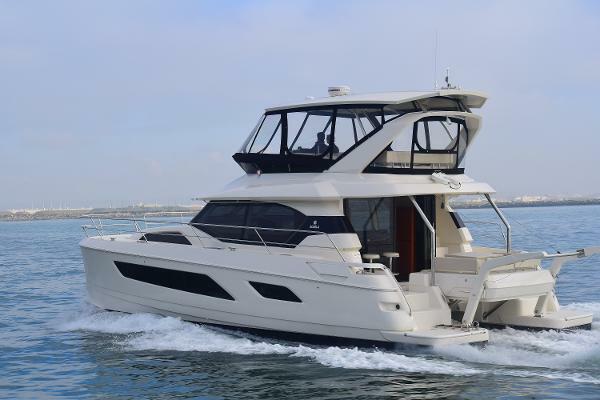 2014 Aquila 48-P 2014 Aquila 48 Luxury Catarmaran w/ Volvo Diesel D6 (310 hp) inboards. This is currently the only available pre-owned 48 Aquila with 4 staterooms & heads in the US. 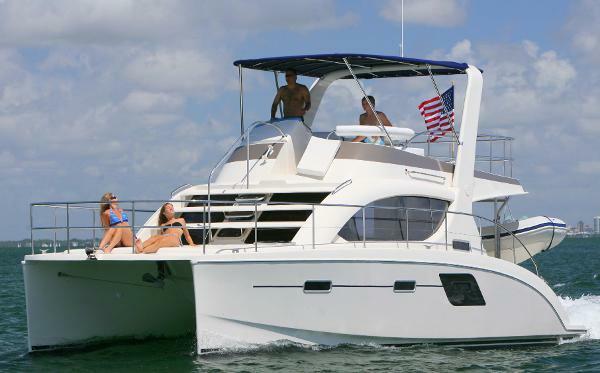 She is ideal for cruising the keys and Caribbean with family & friends or charter. Factory Options: * Upgraded Volvo diesel engines * Upgraded Northern Lights 16 KW diesel gen. * Air conditioning- heat * Hydraulic swim platform * Hard top for flybridge * Stainless steel Davits w/ electric winch * Water maker (41 GPH) * Additional refrigerator in galley * BBQ grill on bridge * Raymarine back up camera * Raymarine Auto pilot * Raymarine E125 GPS-chartplotter * Raymarine VHF Additional added equipment * SAT HD TV * Isotherm refrigerator and icemaker on bridge * Raymarine CP 370 * Engines & Gen service is up to date* Custom built to significantly elevate the boating experience aboard a power catamaran under 50, the Aquila 48 has been developed to set a new standard as the state-of-the-art, pure-bred power catamaran with a perfect balance between luxurious comfort and performance. The Aquila 48 was designed in collaboration with leading experts in the power boating industry including world-class designers, engineers and builders as well as the industrys leading yacht retailer. She represents the newest and most exciting evolution on the market today. The Aquila 48 was also named one of "Worlds best Catarmarans by PMY Magazine. On the Aquila 48, you will quickly notice the attention to innovative design, detail and quality in all areas of the yacht. The main deck offers extended spaces for living large, with beautiful panoramic views and access to both forward and aft covered cockpit seating areas. 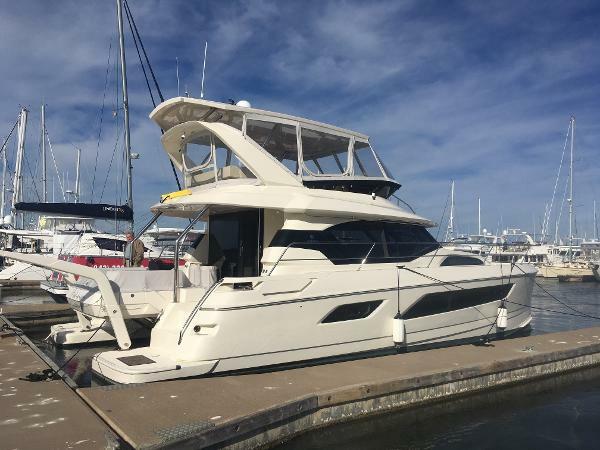 2014 Aquila 48 2014 Aquila 48 Luxury Catarmaran w/ Volvo Diesel D6 (310 hp) inboards. 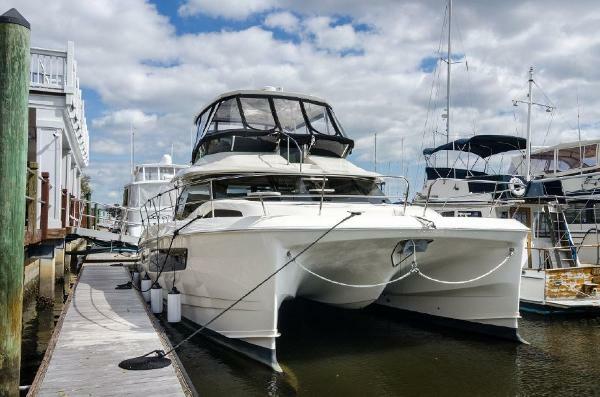 This is currently the only available pre-owned 48 Aquila with 4 staterooms & heads in the US. She is ideal for cruising the keys and Caribbean with family & friends or charter. Factory Options: * Upgraded Volvo diesel engines * Upgraded Northern Lights 16 KW diesel gen. * Air conditioning- heat * Hydraulic swim platform * Hard top for flybridge * Stainless steel Davits w/ electric winch * Water maker (41 GPH) * Additional refrigerator in galley * BBQ grill on bridge * Raymarine back up camera * Raymarine Auto pilot * Raymarine E125 GPS-chartplotter * Raymarine VHF Additional added equipment * SAT HD TV * Isotherm refrigerator and icemaker on bridge * Raymarine CP 370 * Engines & Gen service is up to date* Custom built to significantly elevate the boating experience aboard a power catamaran under 50, the Aquila 48 has been developed to set a new standard as the state-of-the-art, pure-bred power catamaran with a perfect balance between luxurious comfort and performance. The Aquila 48 was designed in collaboration with leading experts in the power boating industry including world-class designers, engineers and builders as well as the industrys leading yacht retailer. She represents the newest and most exciting evolution on the market today. The Aquila 48 was also named one of "Worlds best Catarmarans by PMY Magazine. On the Aquila 48, you will quickly notice the attention to innovative design, detail and quality in all areas of the yacht. The main deck offers extended spaces for living large, with beautiful panoramic views and access to both forward and aft covered cockpit seating areas. 2016 Aquila 44 Working off the success of the popular Aquila 48, the newest addition to Aquila range is the Aquila 44. She has been designed with the luxuries found on the 48 yet is a smaller version with 3 en-suite cabins.On the Aquila 44 you will enjoy the 360 view from the spacious salon and galley that features a large seating area, hidden TV stowage and plenty of storage to make a live-aboard vacation easy and pleasant. Galley features include Corian countertops, electric fridge and freezer, stove and stainless steel microwave oven as well as a double stainless steel sink. The large staterooms each feature ample headroom and large windows for excellent views. A fresh water flush, separate shower stall, and teak flooring compliment the boat’s design and exceptional living comforts. 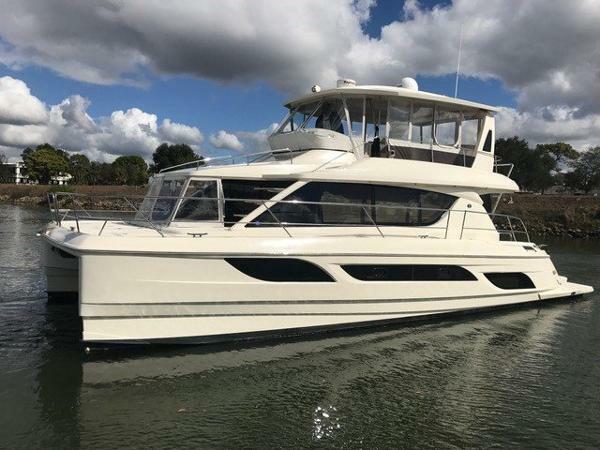 Additional features include an oversized flybridge with added enclosure, electric grill, and sunpad seating on either side of the central helm station. Complete with our revolutionary bridge to bow direct access, the Aquila 44 is a fresh revolution of classic boating traditions.She is available with a 3 Cabin / 3 head version. 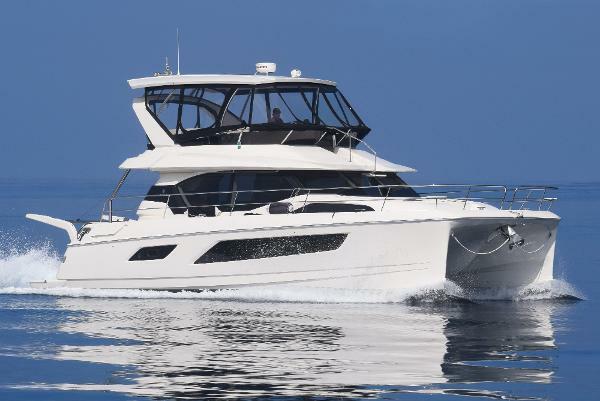 2016 Aquila 44 Working off the success of the popular Aquila 48, the newest addition to Aquila range is the Aquila 44. She has been designed with the luxuries found on the 48 yet is a smaller version with 3 en-suite cabins.On the Aquila 44 you will enjoy the 360 view from the spacious salon and galley that features a large seating area, hidden TV stowage and plenty of storage to make a live-aboard vacation easy and pleasant. Galley features include Corian countertops, electric fridge and freezer, stove and stainless steel microwave oven as well as a double stainless steel sink. The large staterooms each feature ample headroom and large windows for excellent views. A fresh water flush, separate shower stall, and teak flooring compliment the boat’s design and exceptional living comforts. 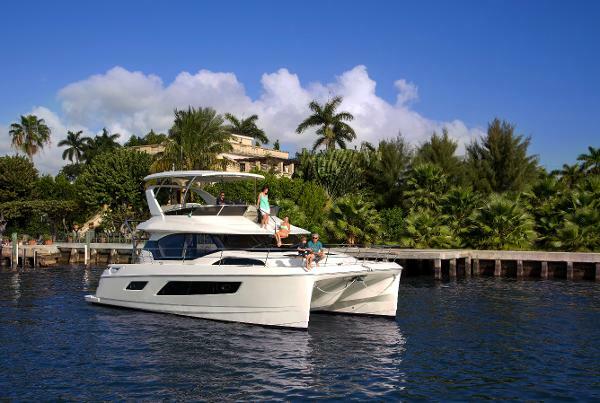 Additional features include an oversized flybridge with added enclosure, electric grill, and sunpad seating on either side of the central helm station. Complete with our revolutionary bridge to bow direct access, the Aquila 44 is a fresh revolution of classic boating traditions.3 Cabin / 3 head version. 1970 Cascade 29 By Yacht Constructors 29' Cascade 29 '72 "Aquila" Aquila has been owned by the same family her entire life. She has been cruised extensively (ten times from Portland to Alaska). The present owner is a yacht maintenance professional so the boat is in every way in excellent mechanical condition. An extensive update has left the on deck and mechanical portion of the boat in like new condition, the interior reflects years of use and with a bit of paint and decorating would complete the restoration. So Aquila is a boat ready to set sail now and be completely usable while any below deck refurbishing can be undertaken as time allows. The expensive projects are done, what remains are the finishing touches that would make this little gem a jewel that will reflect your own personal good taste. 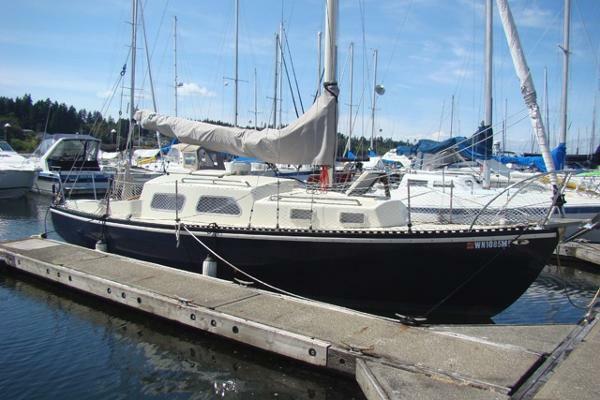 She is being sold as the owner had purchased a larger vessel. Additional Comments: The Cascade 29 was among the earliest of fiberglass production sailboats built by Yacht Constructors of Portland Oregon. The idea was to build a yacht capable of being legally towed over the highway yet large enough to be capable of extended offshore use. The hull and deck were constructed of hand laid up fiberglass during a period that the material was relatively new. The result was an exceptionally strong overbuilt structure that has proven itself out over hundreds of thousands sea miles. The idea was to produce a basic hull and deck that could either be finished by the home builder or in some stage of completion at the factory. Most were sold as hull and deck kits, so the interior layouts and materials between individual vessels vary quite a bit. There were several hundred built and they can be found in ports all over the world. The perfect choice for someone with big plans and a limited budget.